The January 24, 2015 partial practice climb at Stratosphere Tower in Las Vegas is your only chance to #TrytheTower before the March 1, 2015 full stair climb, Scale the Strat. Allowing climbers into the stairwells of Stratosphere Tower is extremely rare," said Kim Huff, Director of Tower Operations. "In fact, this practice climb gives climbers access to levels they won't even see on the actual climb day. Not sure if climbers can tackle all 108 floors and 1,455 steps inside the iconic Stratosphere Tower on March 1, 2015 for the seventh annual extreme stair climb, Scale the Strat? Here’s the only chance to #TrytheTower. The American Lung Association in Nevada and Stratosphere Casino, Hotel & Tower present a special partial practice climb on Saturday, January 24, 2015 at 7 a.m., allowing climbers access to the stairwells at the very top of Stratosphere Tower, Level 101 to Level 112. The cost is $30, and each climber will receive two VIP coupons for free admission to enjoy Stratosphere Tower with a friend on Saturday, January 24 or Sunday, January 25, 2015, up to a $40 value. Climbers can sign up for the practice climb at http://bit.ly/TRYTHETOWER2015 or register onsite the day of the practice climb by the Top of World podium inside Stratosphere Tower, starting at 6:30 a.m. The practice climb helps fund the American Lung Association in Nevada’s mission of preventing lung disease and promoting lung health while giving climbers their only chance to try the tower before race day on March 1, 2015. Practice climbers can tackle the 234 stairs between Level 101 and Level 112 in small groups as many times as possible in 30-minute intervals. Level 112 of Stratosphere Tower is above the world famous Observation Deck and four floors above the official Scale the Strat finish line. As climbers reach Level 112, they will be outdoors and experience one of the best views in Las Vegas. Unlike the full climb, the practice climb is not timed allowing for a more personalized approach and customized workout. It’s a fun way to challenge yourself and friends without the intensity but if climbers are looking to push their limits, they still can. All participants can sign up for the full climb after the practice climb at a special discounted registration rate of $40 (plus $150 fundraising minimum). Additional information about Scale the Strat 2015 on Sunday, March 1, 2015 can be found at http://www.ScaletheStrat.com. Stratosphere Tower Observation Deck hours are 10 a.m. to 1 a.m. Monday through Friday; 10 a.m. to 2 a.m. on Saturdays; and 10 a.m. to 1 a.m. on Sundays. For more information on Stratosphere Tower visit http://www.StratosphereHotel.com. About American Lung Association in Nevada: ALAN has been improving the lives of Nevadans since 1916 when it was founded as the Nevada Tuberculosis Association to combat the devastating disease of tuberculosis (TB). Since that time, ALAN has remained constant in the fight against lung diseases and the promotion of lung health. Lung disease is the fourth leading cause of death in America and ALAN is often the first point of contact for individuals with lung disease. ALAN provides practical help and education to people living with asthma, emphysema, and other lung diseases, confronting this disease at the root level by educating kids about the dangers of smoking, providing smoking cessation programs, advocating for smoke-free environments, and working to reduce air pollution. About Stratosphere Casino, Hotel & Tower: Stratosphere Casino, Hotel & Tower is a Las Vegas Strip resort with an 80,000-square-foot casino. The 1,149-foot Stratosphere Tower is the tallest freestanding observation tower in the United States, featuring the Top of the World restaurant and highest view of the Las Vegas Strip from the Observation Deck as well as SkyJump Las Vegas and thrill rides Big Shot, X-Scream and Insanity. Known as a great value to gamblers, Stratosphere is located close to the Convention Center at the gateway to downtown Las Vegas. It features 2,427 guest rooms and suites, uniquely themed restaurants, the Tower shops and the original production show PIN UP staring Claire Sinclair. Additionally, Stratosphere’s ace|PLAY program allow splatters to enjoy awards,comps and exclusives based on their loyalty to American Casino & Entertainment’s four properties: Stratosphere Casino, Hotel & Tower on the Las Vegas Strip, Aquarius Casino Resort in Laughlin, Nevada, and two Arizona Charlie’s locations in Las Vegas. For more information, visit StratosphereHotel.com, call 702- 380-7777 or 800-99-TOWER (998-6937). Mark your calendar! Scale the Strat 2015 is on March 1, 2015 at the iconic Stratosphere Tower in Las Vegas. 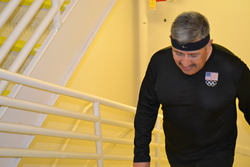 The extreme stair climb benefits the American Lung Association in Nevada. Practice climbers celebrate on Level 112 during last year's Scale the Strat practice climb at Stratosphere Tower. Scale the Strat practice climbers will experience one of the best views of Las Vegas on Level 112 of Stratosphere Tower.